New Beginner I Group Class March 11th! Come out on Monday March 11th at 6:45pm to start your dancing journey! Our beginner group classes last for 6 weeks and cover the basics of three of the most popular ballroom dances. 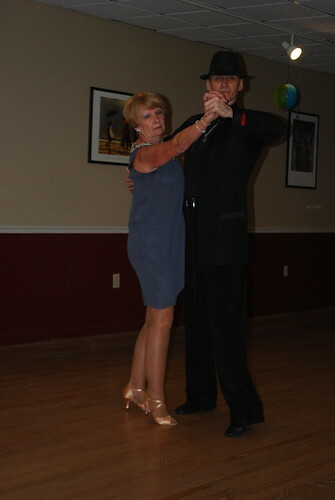 In this upcoming session we will be learning the Waltz, Rumba, and Cha cha. Group classes provide you with the opportunity to dance with a variety of partners, meet new people, and learn how to dance all in one experience! At only $75 per person, and with no partner or previous dance experience necessary, there has never been a better time to start dancing! Come join us for an entertaining day of freestyle dancing and solo performances on Sunday, April 28, 2019! Spectator Admission $15 per person. Doors open at 11am and our first dance will start promptly at 12 noon. Smooth freestyles in the morning, followed by a break for a light lunch (included with admission), and Rhythm freestyles in the afternoon. Solos are interspersed throughout the day and promise to be as entertaining and fun as ever! Bring your family and friends for what will be an excellent day of dancing! We look forward to seeing you all on the 28th! 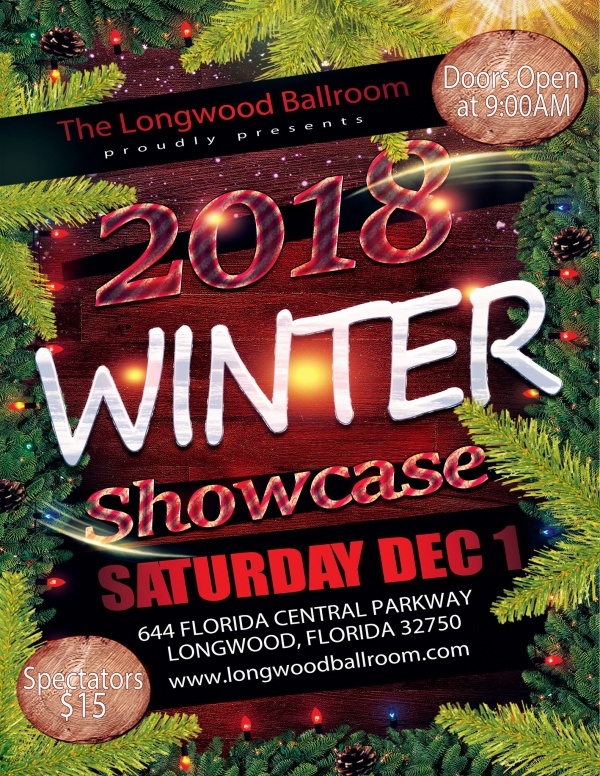 Winter Showcase at the Longwood Ballroom on December 1st! It’s almost that time of year again! Come and enjoy a day of dance, performing, and fun on Saturday, December 1st! Doors open at 9am and our first dance will start promptly at 10am. Smooth and Standard freestyles and solos in the morning, followed by a break for a catered lunch (included with admission), and Rhythm and Latin freestyles in the afternoon. Solos are interspersed throughout the day and promise to be as entertaining as ever! Bring your family and friends for what will be a great day of fun! Check our Facebook event page for regular updates, or call us at 407-339-8880 with any questions. We’ll see you on the 1st! 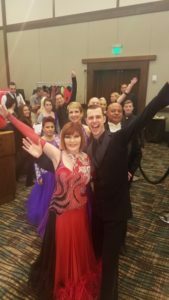 Longwood Ballroom Wins Big at Majesty Dancesport! 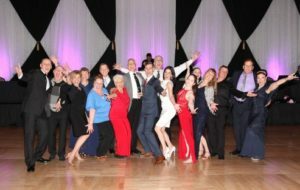 Congratulations to all of the Longwood Ballroom participants in this year’s Majesty Dancesport Competition on January 22nd, 2017 at the Embassy Suites Lake Buena Vista South! A big thank you to everyone who came out and danced, and supported our studio. 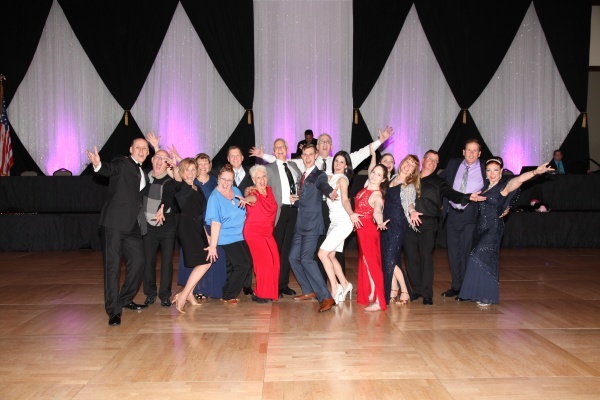 In addition to having an amazing weekend, Instructor William Proper won a Top Teacher Award, and because of everyone’s hard work and dedication, The Longwood Ballroom brought home another Top Studio award for the third year in a row! Dianne and William ready for heat #1 at 8am! 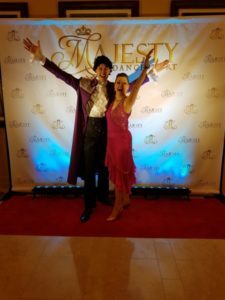 Cindy and William in their Prince Tribute Showdance Costumes. So much fun! Marta and William dancing in the morning Smooth Categories. Marta came in 2nd out of 10 ladies in her 3 Dance Challenge Division! John, Patty, Jackie, Ulli, and Jim ready for a day of dancing and Fun! Rick and his amazing amateur couples! 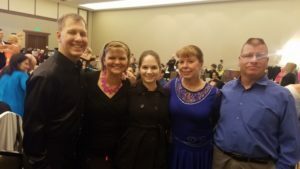 Walt & Jan Ward become USA Dance Vice Champions at Nationals! 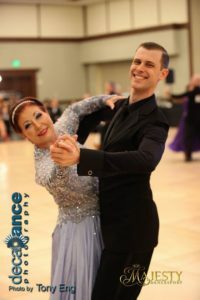 William & Jennifer competed at the Savannah Dance Classic over the last couple of days. 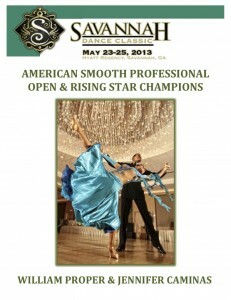 They won their first Rising Star Professional Smooth event on Friday evening. This event started with a 9 couple semi final. On Saturday evening they made it a double win by capturing the Open Smooth title from 7 other couples. We are so proud of them both and know that this is just the beginning of many great wins in the future. 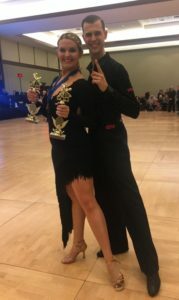 On the last week of November, Jennifer Caminas & William Proper of the Longwood Ballroom competed at the Ritz Carlton Hotel in Orlando, Florida. 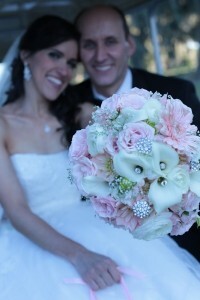 It was another very successful event for our Rising Star Professional couple. 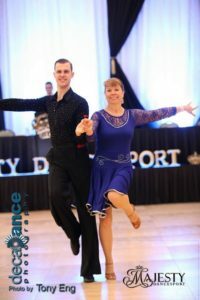 This was Jennifer & Williams last Professional competition for 2012 and it was a great way for them to finish off the year. 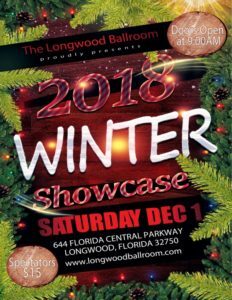 They will be performing on December 15th at our Longwood Ballroom Holiday Showcase. Come out and enjoy this daytime event with us at the studio. It will be a show that you will not want to miss. Held at the World Golf resort in St. Augustine Florida, the First Coast Classic was an extremely successful competition for our Longwood Ballroom Professionals. 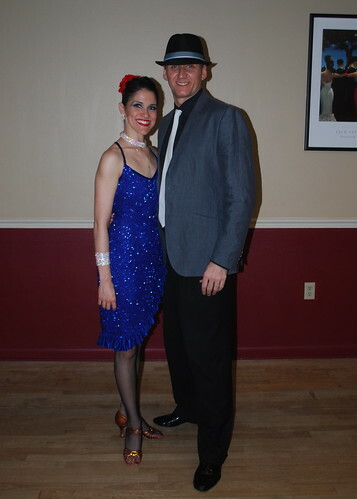 It started out on Friday evening (10/5/12) when Jennifer Caminas & William Proper for the first time made it into the Top 3 out of 8 couples in the Rising Star Smooth Championship. 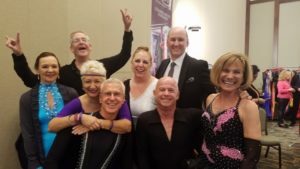 They continued on Saturday placing 4th in the World Masters Open Smooth Championships & placed once again on the Medal Stand in the Bronze position for the World Masters Showdance. 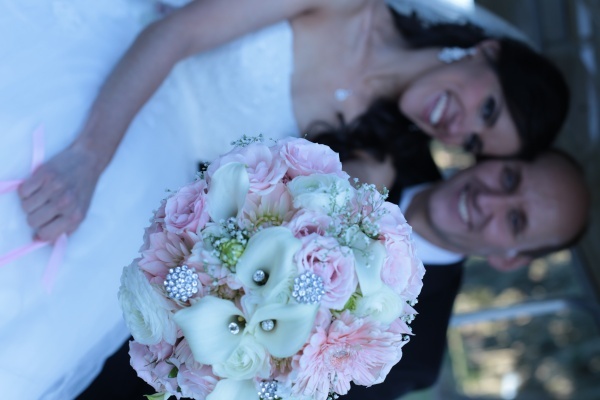 We are So proud of Jennifer & William! Their next professional competition will be at the end of October in Miami at the Grand National Championships. Ballroom Dancing offers many health benefits, besides the obvious physical exercise that we are all aware of! CALL NOW & START DANCING TODAY!